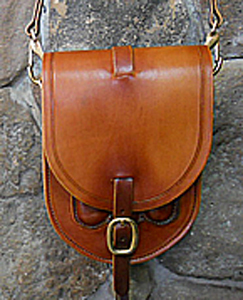 U.S. Army mess kit leather carrier for your saddle or great for hunters, hikers or your ATV. 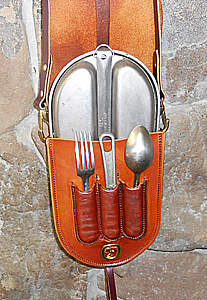 Shown with pockets for fork, spoon & knife (included). 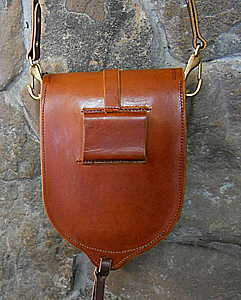 Adjustable strap for saddle attachment, complete with tie down on bottom of leather case, or use over the shoulder strap for hikers, campers and backpackers. Leather mess kit carrier also has a belt loop on the back for those who want to pack their mess kit on a belt. 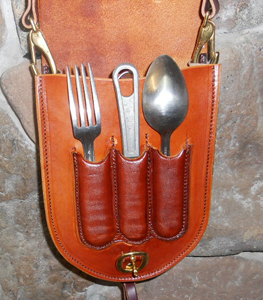 Saddlebag mess kit is shown in Russet USA leather with brass hardware all our leather color choices available. Leather mess kit is shown with simple lines or we can customize with your name, initials or choose from our many stamping designs. 2 piece mess kit includes 1 cooking pan and 1 divided pan for eating. Cooking pan is appx 7" wide x 8" long x 2" deep. Pan handle is 81/2" long. The cooking pan goes on the bottom of the kit and plate goes on top then cooking pan's handle goes over the plate and hooks in metal d-ring to keep pan shut and together. Top quality stainless steel knife, spoon and fork are included. U.S. Army Leather Mess Kit $175. To order, please use the Saddlebags section of our online order form to order your mess kit as shown, or give us a call at (775) 770-4606 to customize your mess kit.